All the way in the corner it was a Heinkel Scooter type 101 who’s from the very first serial og Heinkel Scooter. It was a 1954. Heinkel has made over 170000 scooters + mopeds and cabinrollers, but under 6500 of this first model . Denne scooteren ble bygget fra ca september 1953 til ca mai 1954 i 6500 eksemplarer. I dag er det ca 100 kjøretøyer kjent, og dermed er det en av de sjeldneste typer kjøretøy av fabrikken Heinkel. Den korte byggeperioden av 101 A0 er preget av mange små endringer, kan du tydelig se at Fa. Heinkel deretter måtte endre ting i serien, og de første kjøperne var trygge testførere. Det er også garantert at de første omtrent 200 til 250 kjøretøyer fikk en handlagde karosserier på grunn av mangel på karosseri presser og verktøy. Disse delene avvike noe i styling og finish fra de senere serie scootere. Selve serien synes å ha bare startet i januar 1954. Produksjonen av den nye modellen 102 A1 ble regnet fra chassisnummer 120001 og motornummer 410001, slik at de mellomliggende tallene ikke ble tildelt. Teknikken i den første serien ser ikke ut til overfladisk å være så forskjellig, men nesten alt er forskjellig. Disse moduler er, fordi senere aldri brukt på nytt, i dag tilsvarende sjeldne og bør være så fullstendig og intakt dersom et kjøretøy, er å bli gjenopprettet original. Det er mange andre detaljforskjeller, men kan ikke bli navngitt individuelt her. Ofte er det gjort endringer allerede av de første eiere som reparasjoner, skade på panseret foran etterfølger modellen ble for eksempel ofte byttet med avtagbart hovedlys nese. Anskaffelse av Stempelet for motoren er lett fordi de 60 mm stempler (standard størrelse) av de 175 cc modeller enn andre store partikler (standard størrelse på 150 cc: 59 mm) kan brukes. Likeledes kan alle elementer av sylinderhodet benyttes av de etterfølgende modeller. Ernst Heinkel was born 1888 in Stuttgard, Germany. He had a long interest in aeronautics stretching back to 1908 when he witnessed his first Zeppelin flight at nearby Lake Constance, the home of Count von Zeppelin’s airship company. By 1911 he had built his first aeroplane from the blueprints of a French Farman. It crashed and he was nearly killed but his efforts ensured him a place in the fledgling German aero industry. During the First World War he was one of the designers working on the famous Albatross fighter which saw extensive use on the western front. After Germany’s defeat, the Treaty of Versailles imposed a ban on the manufacture of German aircraft so he was forced to work for overseas aircraft companies, but by 1922the restrictions on civil aviation were withdrawn. 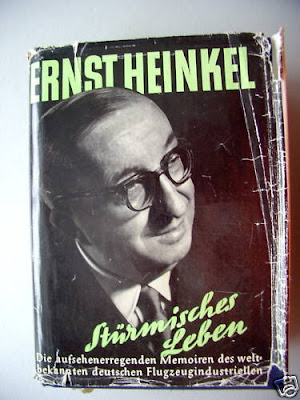 Heinkel established his own company the same year. Heinkel Flugzeugwerke Gmbh went on to produce some of Germany’s most famous aircraft. 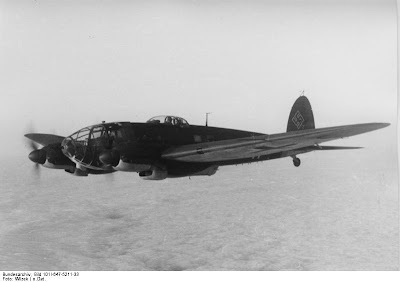 The Heinkel 111 medium range bomber remains one of the archetype German bombers of the Second World War. Heinkel was also a pioneer in jet propulsion, launching the worlds first jet powered aeroplane, the Heinkel He 176, in 1939. Inevitably, as a military industry Heinkel’s factories were extensively bombed during the war, leaving the company in ruins. Heinkel’s involvement with the Nazi war machine could have earned him a place in Nuremburg with other military industrialists, but his aeronautical know how was too valuable for the Allies to lose. Certainly some sort of deal was done with the US Airforce gaining access to Heinkel’s aircraft designs and his most talented technicans while Heinkel retained control of his company. But like Enrico Piaggio in Italy, he was banned from manufacturing aircraft. 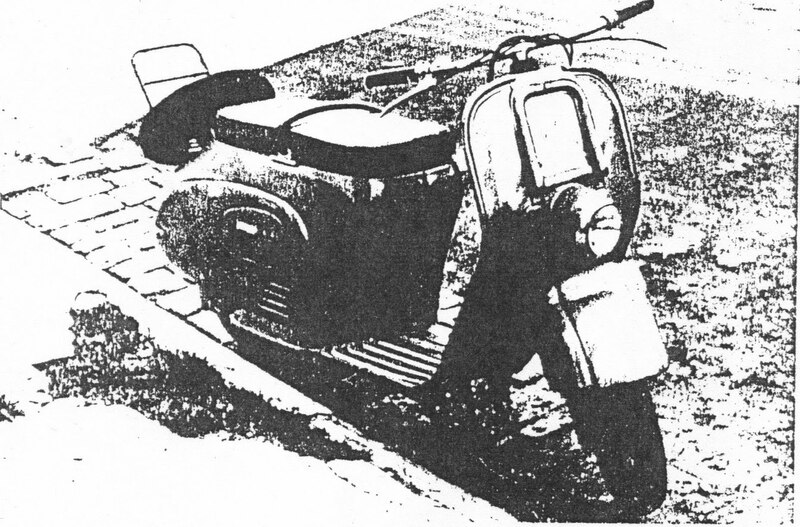 Finding himself in an almost identical situation to his Italian counterpart he came to the same solution and in 1949 he began work on a prototype scooter. Although work on the first Tourist prototype began in 1949, the model was never shown until 1953. Superficially it bears a resemblance to a Lambretta LC. Certainly NSU were producing LCs under license at this time, while aircraft manufacturing rival, Messerschmitt were building Vespas, so it’s likely the design was based on its Italian contemporaries. 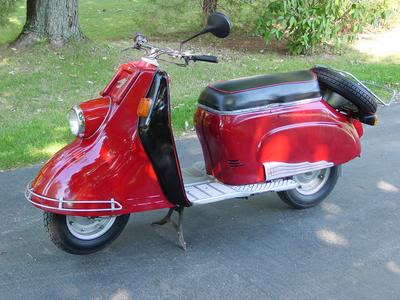 From the front, the Lambretta resemblance is quite marked, except that the headlight is placed lower down in order to accommodate the distinctive folding luggage rack. The rear body however is classic Heinkel and would remain unchanged until the 103-A2 came along in 1960. 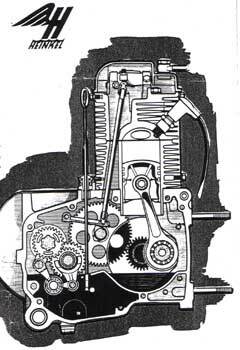 The prototype featured a 149cc four stroke motor, three gears and 8 inch wheels. It was shown at few auto shows but was never put into production. 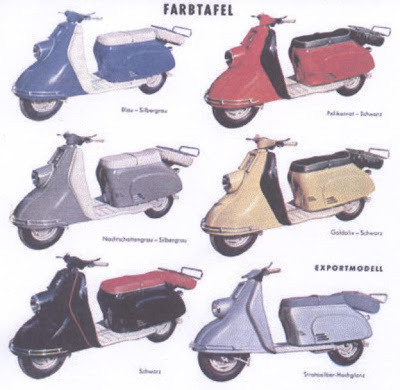 Sometime between 1949 and 1953 German scooter fashions must have underwent a dramatic change. Certainly influential precursers like Bastert’s “single track car”, the gorgeous Einspurauto, set a distinctive standard. Like the earlier Maico-Mobil and Glas-Goggo, the Einspurauto featured a streamlined fixed faring over the front wheel – well, it looked streamlined on the Einspurauto; on the Goggo and Maico-Mobile it was just bulbous. The 1953 Tourist 101-a0 was pretty much identical to the 1949 prototype but now featured a streamlined fixed faring over the front wheel that was half way between the sleek Einspurauto and the bulbous Goggo. There were no other mechanical changes. Heinkel built approximately 6,500 between July 1953 and August 1954. The Tourist 102-A1 released in 1954 featured a small number of innovations over its predecessor. Firstly it had a larger 175cc engine. 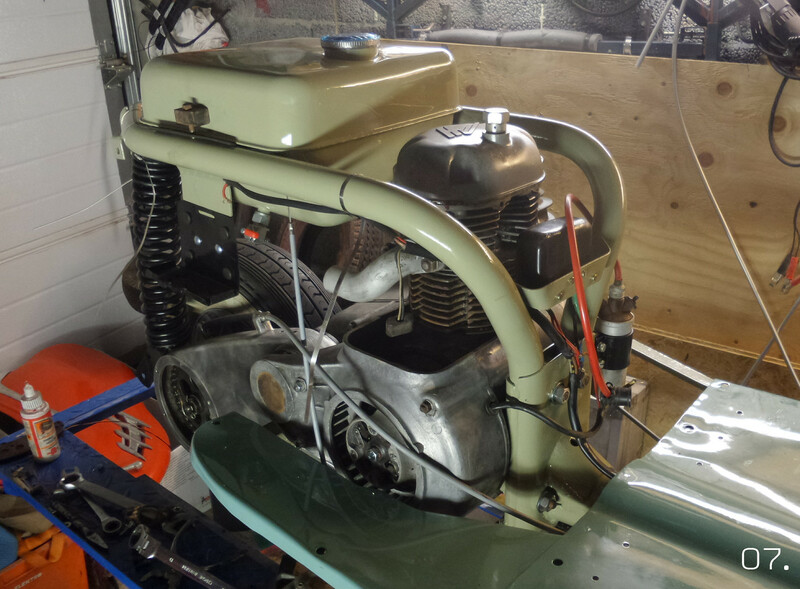 It also featured an electric starter motor and completely did away with the kick starter. No only was this quite a luxury for the time, it was indicative of confidence Heinkel had in the reliability of its product. All other mechanical features were largely unchanged. Although the 102-A1 was only in production for a year, it began to establish Heinkel’s reputation for building good quality scooters. 17,500 were built. Heinkel were now hitting their stride. The 103-a0 was the natural progression from the 102. The 103-A0 was given four gears, which improved performance, and 10in wheels to improve road handling. Otherwise, it was largely the same machine. Production ran from 1955 to 1957 and delivered 34,000 machines to the domestic German market. 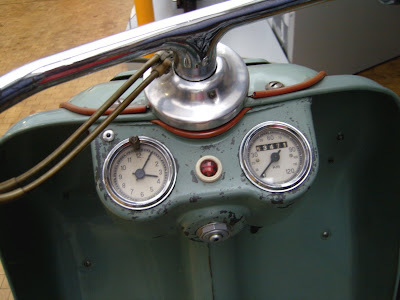 Mechanically, the A1 was basically the same as the 103-A0 but the handlebars, naked up to now, were enclosed to house the speedometer and other controls. The body remained unchanged. Production ran for three years from 1957 to 1960 and 50,000 machines were delivered. Heinkel were now developing an export market and a small number of 103-A1s were sold in the US and UK. In 1960 Heinkel decided to revamp the Tourist design, which was now getting a little old. The front end remained largely the same but the rear body was extended and remodelled to be little more ‘hip’ and included features such as built in indicators. Exports also picked up with specialist dealerships in the US and UK now carrying the scooter. 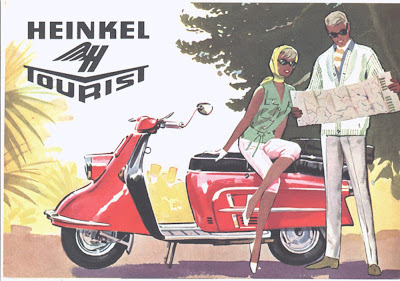 Heinkel capitalised on the Tourist’s reputation for reliability and quality – essential marketing features given that Tourists were expensive vehicles and definitely at the top end of the scooter market. The 103-A2 was built between 1960 and 1965 with 55,000 rolling off the production line. Here is a link to a review of the Heinkel Tourist by Cycle World Magazine from June 1962. While the Tourist delivered at the top end of the scooter market, Heinkel was also experimenting with mopeds. 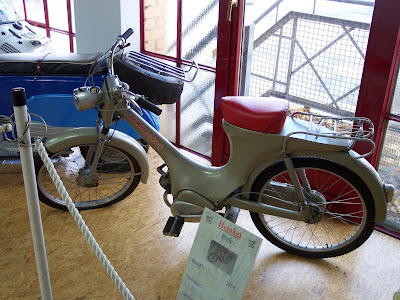 In 1953 it released the Perle, an elegant 50cc moped. 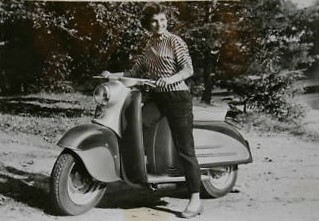 In 1957 they attempted to build a mid range ‘economy scooter’, the 112, with a 125cc engine, but it could not compete with the cheaper Vespas and Lambrettas and never got past the prototype stage. This photo came up for auction on ebay.de proporting to be of the Heinkel 112 prototype. 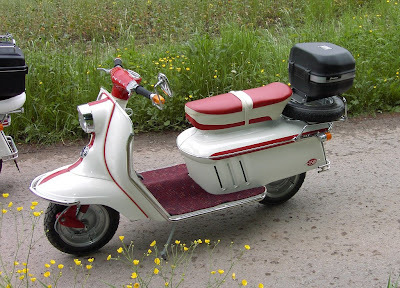 If it is legitimate then it certainly bears a strong resemblance to a Polish Osa and more traditional scooters, like the Maicoletta or IWL Berlin. I have my doubts though. In 1962 Heinkel again tried to break into the mid-range market, this time with the 150 featuring … you guessed it, a 150cc 2-stroke engine. 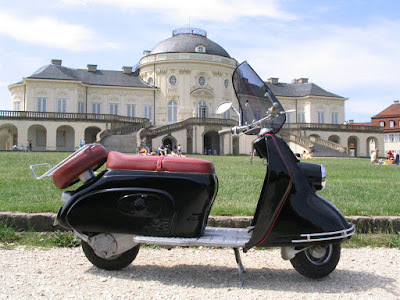 Smaller than the Tourist and with revised styling, remininscent of the Japanese Fuji Rabbit scooter, the 150 was not the success Heinkel hoped it would be. Sales were disappointing and the model was withdrawn in 1964 after only 7,000 were built. Heinkel’s reliable, economic and powerful 175cc four stroke was also used to power their popular microcar, the Kabineroller. 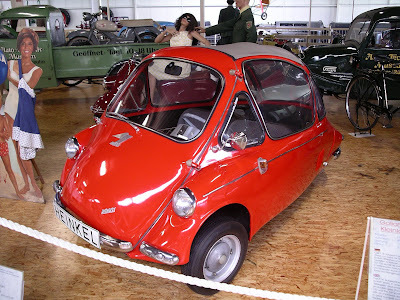 These three wheeled bubble cars were also built in Ireland for the British export market as the Heinkel Trojan. The 1960’s saw the inevitable decline of the scooter industry around the world. The war battered economies of Europe and Japan had now recovered sufficiently for people to consider cars as their first choice of transport, and if two wheeled transport was still desired, it was inevitably in the form of more powerful motorcycles. Demand for scooters rapidly tailed off. In 1965 Heinkel opted out of the automobile market. Heinkel’s customers however were not so eager to see the demise of the marque and the Heinkel Club Deutschland bought all the spares, designs and machine tools for the Trojan, Tourist and Perle. They continue to manufacture parts and provide service to club members today. For Heinkel Gmbh, scooters had been a prop to support their recovery, never their core business. Getting back into aircraft manufacure remained their focus and in the mid 1950s, with the Cold War heating up, the restrictions on the German aviation industry were removed. Heinkel were soon back in the game building US Lockheed Starfighters under license for the German Airforce. As the 1960s progressed there was a flurry of mergers between the many German aircraft manufacturers, including Dornier, Junkers, Blohm and Voss, and Messerschmitt and in 1965 Heinkel’s aircraft wing was merged into VFW (a conglomerate including Focke Wolfe). In 1981 VFM was mergered with Messerschmitt-Bolkow-Blohm. Each of the component companies however seemed to have retained a degree of independence as Heinkel is still listed as one of the companies involved in both the Airbus and Euro-Fighter projects. Not all of Heinkel was absorbed into VFW and MBB. A heavy industrial arm, specialising in turbines, centrifuges and chemical processing still continues to trade as Heinkel GmbH.